Just a few short months ago a County Tyrone family began to make enquiries about a long held family heirloom recently re-discovered. The item in question was a small silver medal bearing the name of a family forebear, George Monaghan. As is so often the case, the family concerned whilst being settled in Tyrone and with close relations in Scotland, England and Australia; had its roots elsewhere in Ulster, namely County Cavan. George lived in the vicinity of Arva in Cavan, and family folklore acknowledges that he was a Boer War veteran and a staunch Orangeman. What the family did not realise however is that George had a further notable place in history. Bearing the slogan ‘In honour of the Loyal and Brave Ulstermen’, the medal had been awarded to George following an Irish event that delivered a new word to the English language- Boycott. The land ‘question’ in Ireland had been a long running cause of tension; with the issues of rent, fixture of tenure and free sale combining with evictions, to create a highly emotive recipe for confrontation between tenants and landlords. Many tenants felt genuinely aggrieved, whilst for their part, landlords (many of whom only owned small plots) simply operated within what was the preeminent economic and moral thinking of the times. Landlords were not particularly greedy, selfish or evil; they simply believed that ‘free-trade’ was paramount, and that there was a natural order in society in which individuals would fall into their own worthy place. In October 1879 the Irish National Land League was formed, and a new episode in the ‘Land War’, the campaign to reduce rents and stop evictions, began. Less than a year later Charles Stuart Parnell made a speech to League members in County Clare that would have far reaching implications. Parnell spelt out what should happen when an evicted farm was taken over, explicitly that the person bidding on or taking the evicted far should be ‘shunned’. Shunned on the side of the road, shunned in the streets, shunned in the marketplace and even shunned in Worship; Parnell spelt out that those that were deemed to be transgressors to the movement be isolated in every way from their surrounding community. This new set of tactics would soon be put into operation in a setting that would garner interest across the world. On the 14th of October 1880 a letter appeared in The Times from Captain Charles Cunningham Boycott of Lough Mask House County mayo. In it he described how the Land League had been implementing a campaign against him and his family since September 23rd. He could no longer get anyone to work on his farm, or even in his house; he could not get supplies locally and had difficulty posting mail; his animals were continually driven into the roads and generally his property was being destroyed and his ability to manage his farm untenable. 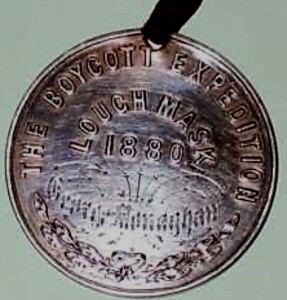 His plight was investigated by an English journalist, who visited and interviewed Boycott, and soon events around the situation began to snowball. General suggestions made included that several train loads of Orangemen from Belfast would make their way to Mayo to bring in Boycott’s crops, but the possibility of that action in causing an outbreak of sectarian violence saw it abandoned. Instead on the 10th of November 1880 a total of 32 Monaghan Orangemen and 25 Cavan Orangemen including George Monaghan, made their way to Lough Mask. One of the main funders of the ‘Boycott Relief Expedition’ was the Belfast Newsletter. Its progress was reported across the entire world, while the party was also accompanied by foreign journalists (including one from Russia! ), all of whom were anticipating a confrontation in the Mayo mountains. Despite being considered an ‘Invasion of Mayo’ by some nationalists, confrontation did not come. Terrible weather helped to calm the situation, as the men escorted and guarded by hundreds of soldiers, made their way to the Boycott farm. The hard labour carried out by the Northern Orangemen included lifting 17 acres of turnips, mangolds and potatoes; while also threshing 20 acres of corn that had already been cut. They departed Mayo on the 28th November 1880. It had cost approximately 27 times the value of the crops to harvest them, with Captain Boycott and his family also having to leave their home, but a moral victory against the land league was claimed. In February 1881 in County Monaghan a special gathering was called to celebrate the success of the endeavour, with a total of 71 specially commissioned silver medals struck, and with 57 of those going to the Ulster men who had participated. George Monaghan was unable to be present to receive his medal. By now he was a part of ‘the Emergency Men’, who were engaged in relieving many other besieged landlords across the West of Ireland.